Rowayne was born in March, 1930 in Howell, Box Elder County, Utah and Marilyn in January, 1933 in Clearfield, Davis County, Utah, but met in Sterling, Idaho were their families had moved. 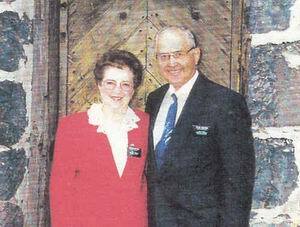 They were married in December of 1952. Five days later he left his new bride for Korea for 17 months. On his return Marilyn met him in California and they had their first honeymoon. They moved to Sterling, Idaho and in 1969 bought their ranch from his folks. Here they raised three boys and two girls. They were asked to serve at Cove Fort and loved working with all of their missionaries! Some think that Cove Fort isn’t a real mission but they would tell you differently. They and their missionaries testified of the truthfulness of the gospel of Jesus Christ and demonstrated their love of the Lord through their hard work and actions towards each other and their visitors. The missionaries did all kinds of work: clean, take care of the gardens, mow grass, conduct tours, help the sick, the old, the young and those that needed a wheel chair and anyone else in need.